Ceramic braces for equally as aesthetic as they are for function, and they are made to look like the color of the teeth, thus the braces sometimes go unnoticeable. 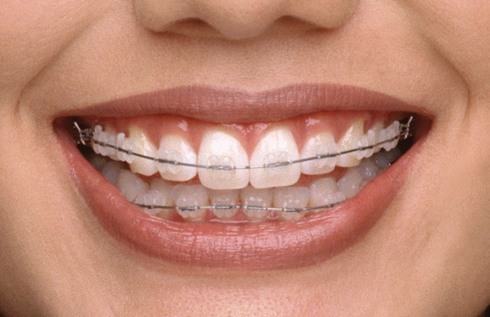 These are more preferred than the metallic braces because the Ceramic braces are made to look similar in color of that of the teeth. The more good at looks, the more is the need to take care of the braces so that the color doesn’t go away, and the staining of the braces doesn’t happen. For those who get these Ceramic braces, they need to take care of the braces with the following steps to be kept in mind, these are rather some changes in the lifestyle that are needed when the braces are worn during the treatment. Check below for the different ways of how to prevent the staining of the ceramic braces. This is one of the very important points, but cannot be given justice to, always. The brushing of teeth after every meal has to be practised not just by the ones who have the braces worn, but also by the children who are at the learning stage, as the regular brushing after meals would keep the mouth clean and prevent both, staining and the decay of the teeth. Same is the case with the ceramic braces, where the brackets of the braces have narrow spaces and the food sometimes stay there after the meal, thus proper brushing is required. Along with the brushing, flossing and rinsing the mouth with mouth wash / water keeps a check of all the dirt and keeps the mouth clean, by even cleaning the areas where your toothbrush doesn’t reach with ease. If not being done properly and regularly, the ceramic braces would start showing some color changes and finally, become stained. There are certain foods which are to be avoided while you have the ceramic braces, but these might not be totally ignored. Try to keep a list of the food products which are to be avoided when the braces treatment with ceramic braces is going on. The foods that are to be avoided, include Tomatoes and food with tomato pastes because of the red color which is not easy to remove, Mustard for the yellow staining of the brackets, and drinks like coffee, dark colored soda drinks. The percentage of smokers who visit a Dentist for the staining and discoloration of the teeth is quite high, and that is the reason why people with ceramic braces are asked to totally stop smoking when the ceramic braces treatment is going on. The nicotine in the cigarette gives a yellow color which removes the aesthetic appeal of the braces, and the biggest disadvantage with this stain is that it doesn’t get removed on normal cleaning as these stains remain permanent, and different ways of cleaning have to be followed if these stains are to be removed. Ligatures are the rubber bands which are tied around the brackets, and one who is getting the treatment done would have been told by the Dentist about it, and about the time when to come back for the change of ligatures. The ligatures are a symbol of beauty for people, as they come in different colors and they even come in white color and thus the staining is very much possible, giving a tainted look to the face. Having some colored braces is a good option, but if you are someone who is more concerned about the looks, keep getting the ligatures changed frequently, as cleaning them is not easy. This has been a big myth that whitening toothpastes will keep the ceramic braces free from stains, but it is actually the reverse of it. The whitening should happen as it always does, and both, your teeth as well as the brackers are kept white, but the actual problem is seen when you get the braces removed. There is a clear demarcating line seen between the areas whitened and the area below the bracket which was removed and this actually looks very ugly. It’s better to use the other ways of properly cleaning your brackets rather than using a whitening tooth paste for the same. The appointment with your Dentist is very important, and you have to be there on the exact date given because the Orthodontic procedures where braces are involved, needs timely care and assessment to check how good the treatment is going on, and the ligatures have to be changed from time to time, and thus, you have to visit your Dentist on the given time. The progress won’t be the same if you are skipping any appointments nad not getting your braces checked. Most of it is just simple things you need to do to keep the braces free from stains, but if you are overdoing it, you are again doing a mistake. Using an electric toothbrush would be a better option than a manual one, because the brushing is then at a particular force and it is capable to reach the areas better for cleaning.